A vision of purple (it will make sense when you see her! ), Rabbi Tiferet Berenbaum has been at Temple Har Zion since 2017. She received her non-denominational, neo-Chassidic rabbinic training from Hebrew College in Newton, MA as well as her master’s of Jewish education. She exudes a joyous and enlivened expression of Judaism. She has a strong passion for working with children and a deep commitment to connection across generations and across communities. Rabbi Tiferet captivates with her warmth, knowledge, and beautiful singing voice. Originally from Brookline, MA, Rabbi Tiferet studied at Tufts University in Medford, MA, majoring in Judaic studies and clinical psychology. After college, she spent six years deeply immersed in Torah, Talmud, Midrash, halacha, practical rabbinics, Hebrew and Aramaic languages at Hebrew College. She spent her summers in the New England Berkshires living, growing, teaching and serving at the Isabella Freedman Jewish Retreat Center. Exposure there to Renewal Judaism and others streams of Judaism coexisting and influencing each other shaped her own personal practices and outlook on what is possible within a Jewish framework. She has taught at numerous synagogues and day schools, as well as directing summer camp and establishing an independent youth education program. Rabbi Tiferet previously served for four years in Milwaukee, WI at Congregation Shir Hadash, a Reconstructionist congregation. There, she cultivated interfaith collaborations, a greater depth of musical liturgy and social justice activism. This core belief translates into her work. Her rabbinate is built on a foundation of relationships. She desires to know each congregant personally and cultivate relationships in order to tailor their experience of Judaism and meet them where they are. 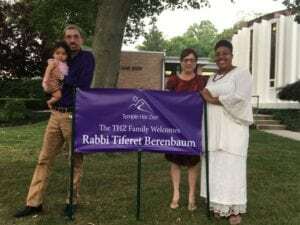 Feel free to be in touch with Rabbi Tiferet, she is eager to meet you!